A couple discussions brought this topic here. A short while ago I had a visit from Jake Henderson. Jake is a member here and I believe a staff in some degree. Jake and I have had several great chats off another website and he asked if he could stop by on his way home and did so. Like I said, we had a very nice chat. Brennan and I have had a similar chat recently and between Jake and Brennan the topic of Gulp and plastics came up. Jake has seen first hand what I'll mention here so I'll use him perhaps more than Brennan for reference. Several years ago Gulp came roaring into the fishing scene and in my opinion did so by storm and for a good reason.....the stuff works. A good friend is an Ambassador to Berkley and he had me supplied with these Gulp 1" minnows a half a year before they even hit the store's shelves and it was at this period of time that I found a great trust in the stuff, especially in the crappie and panfish areas. It was spooky how well the little minnows worked. Step forward to about three weeks ago and Jake's visit. Jake and I retreated to my work room and got the heat running and we spent maybe an hour out there talking about tackle crafting and how what we make applies to how we fish. Somewhere in the discussion on crappies and panfish the mention of Gulp arose and I think I smiled or something because Jake seemed to pick up that I had my secret on the stuff. After a couple questions I opened the closet and puled out my crappie tackle pail and started unloading. I finally saw what I was after and pulled up three jars of the Gulp minnows and handed them to Jake and said for him to open them and take a peek. Right off he asked where I got the minnows inside since they were obviously larger than those of the 1" swimming along side. Then I showed him the same baits in a tackle tray. Maybe three years ago I began to add the same minnow baits to the Gulp jars thinking that by osmosis they may acquire some of the Gulp's scent, or pheromone, or whatever. Now I'm not a research scientist so I have zip to offer as evidence that this process works, but I can tell you that on days when the Gulp minnows are working to a certain degree, the minnows mimicking those Gulp in color but not in the juice catch more fish. This could be due to the slightly larger size. I can also tell you, through practical field use, that those larger minnows soaked in the Gulp juice do much better than an identical bait that has not had any influence from Gulp. Way better. So I am inclined to feel that my osmosis theory works. I have three jars of the Gulp minnows always in the pail and those jars also have like colored baits in them. The chartreuse shad jar as a chartreuse laminate in it that resembles the Gulp color nicely. The same with the Smelt color and the Lumi-glow white, although there are none of the Gulp baits in that jar....yet. These three are my absolute go-to's when Gulp becomes the fishing force for the day. I think that the 1 7/8" minnows simply off MORE to the fish than the factory baits and accounts for more fish do to the larger size but the scenting is still a huge factor I feel. Here are the baits with the factory counterparts near them. I'm certainly not trying to change the way people fish, but I think this is something that serious anglers should consider. Both Jake and Brennan have had an earful of my thoughts on this and Jake has seen the jars come out or my tackle pail, opened them and seen the contents personally and up close. Jake knows I am dead serious on this. Jake did not see the jars with the 1.5" Thump-Its in them....there were two more with these in the pail that did not come out. If you're a panfish or crappie angler and are looking for a way to up productivity, I suggest you start right here using this method and using ANY plastic you have faith. I'm saying this works as I have seen a friend stand within 15 feet of me casting the same identical bait/jig, in the same identical spot on the water, at the same identical depth and catch one fish for my 5. When he hung one of the doctored baits an his jig he as immediately into crappies. Like I stated at the front of this, I am not a scientist. But I know what is working when I see it. Gulp juice will not freeze at winter temps so I has to have something other than water in it and its an oily feeling liquid when you get it on your hands. The only way a plastic can absorb anything is if it is a soluble fluid and I thinks that the juice's components are key to the baits working better than those which have not been doctored. I think the juice is emmulsifiable and is the reason fish can detect it so easily. Regardless, its an interesting observation. I don't have any plans of ditching this little practice because it works too well for me. I started to scent (aka cross-contaminate) other brand plastic worms back the late 80s by storing them in the same bag as my Berkeley powerbait was in... it may not be as good as the original, but it definitely does work. I did the same at about the same time with power bait. And my observations were favorable too. Like you said, maybe not as good as the original but better than without the help. Some questions: What is the shortest time you have put baits in gulp and had then work? In other words should you put them in the gulp the night before a fishing trip; or can you put them in just before you leave to go fishing? I know if you take the baits out of the jar; they become "hard" and useless. (MY findings) 2. What about this new Maxscent? This is a super bass bait; haven't tried it on crappies yet. Anyone out there that has? Now I know one of the secrets us bass guys had back in the seventies was to take a jar of pork rind (the trailer we used on jigs). We would take about half of the liquid out of the pork rind jar and replace it with Fish Formula. It seemed to catch more fish. We've done this the last few years up in Canada. We have done what we call minnow verses gulp. A bag of minnows soaked in gulp is easier to portage than a minnow bucket full of water. I have tossed a plastic minnow soaked in gulp in the water and have watched a pike crab it. He spits it soon after but by then he's hooked. 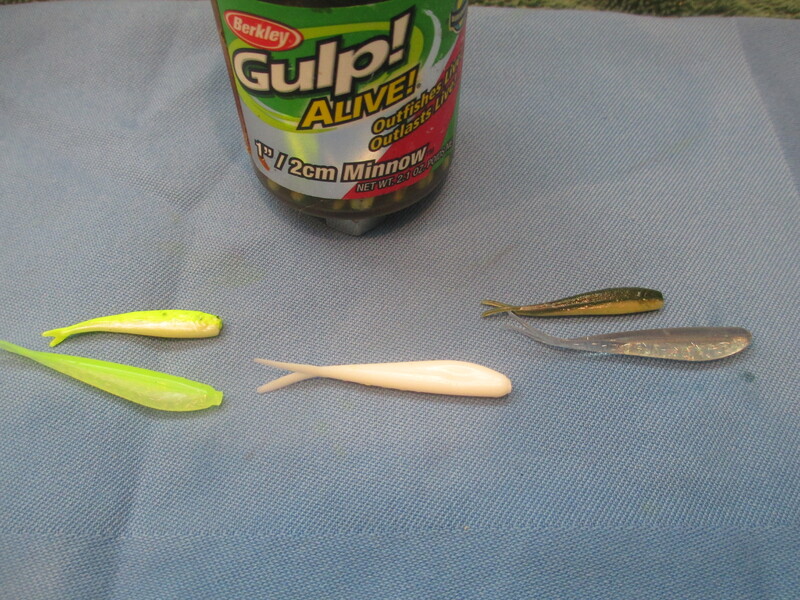 When I got the bug to do this Gulp experiment I let the baits sit for three months before I tried them. Honestly I wasn't at all sure how long was long enough so after the early summer flurry was over and the crappies went deep I put the baits in the respective jars and didn't use them until the fall bite started to come around....early Septemberish. Never tried the Maxscent but its on the list. I'd be willing to bet that if you dumped out the brine on a jar of pork and re-filled it with the Gulp re-fresh fluid you'd find a winner Gary. Being a flesh product I think a coupl days of soak and fish and you'd be in high times.